Vamona Navelcar – the first time I heard the name 4 years ago, it meant nothing to me and probably to many people in Goa too. It took a UK expatriate’s curiosity and fascination with the genius of this man for us to become aware of him. Anne Ketteringham, a retired aeronautical engineer, despite her lack of education in the area of fine arts, was mesmerised by the man and his paintings. She persevered in her quest to document his life, even travelling to Portugal to confirm facts, and the result was her insightful book Vamona Navelcar, An Artist of Three Continents, which was published in 2013. Vamona Navelcar is both an enigma and a role model to be emulated. His art shapes him as much as he shapes his art. In these modern times, where fame and money are hailed as the ultimate accomplishments, this octogenarian shuns them to epitomise integrity. He has lived by his principles all his life and no political duress or fear of loss could inspire reasons disregard them. Many artists cater to a consumerist society but Navelcar refuses to indulge superficiality. This admirer of Gandhi, Bertrand Russell and Jesus Christ makes it clear that truth must be inherent to art. 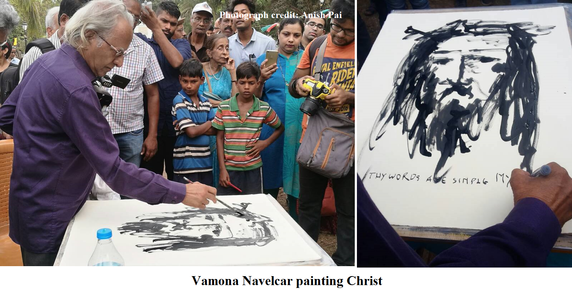 Navelcar’s prolific Christian themed art, of Jesus Christ in particular, makes him singular as an artist born in the Hindu faith. Perhaps this is also the reason that denies him the national recognition he deserves. Here is an artist who was conferred the Calouste Gulbenkian Foundation Grant in 1962/3 and 1974, has won an international award for his ink drawing ‘Angoche Woman’, and has exhibited his works the world over, including Goa, and yet has not found the acclaim that is due to his level of skill. His versatility in artistic techniques, be it stained glass, ironwork, tapestry, ink work, water colour, oil painting, etc is astounding, as are his unique continuous-line drawings without taking the pen off the paper and producing images of characters such as Mahatma Gandhi and Don Quixote. Born in Pomburpa, Bardez, Goa, Vamona Ananta Sinai Navelcar’s passion for art was not encouraged by his parents as it was deemed a degrading profession, aside from the fact that art supplies were expensive and beyond the means of this family earning a modest income through their grocery store. But Navelcar found ways to express the budding artist in him by drawing and scribbling wherever he could, even behind a calendar, which his father found out and berated him for. As a child, Navelcar refused to adhere to the prejudicial attitudes of society, especially concerning the caste system. Although a high caste Brahmin, he could not tolerate bigotry. At the age of 12, when a friend was told to leave the temple as he sat down to the meal served following the religious ceremony, Navelcar left along with him. Opportunity came knocking when, under the employment of Vishwasrao Chowgule, Navelcar was asked to produce portraits of Paulo Bénard Guedes, Governor General of Goa at the time, and Overseas Minister Manuel Sarmento Rodrigues. Guedes was very taken with the portraits and after a futile attempt at convincing Navelcar to go to Portugal to better his talent, Guedes asked him to capture Salazar, the prime minister of Portugal, in a portrait. The portrait won Navelcar a scholarship from Salazar. After many protestations, Navelcar finally gave in and left for Portugal in 1954. On the journey he unwittingly consumed beef believing it was mutton. He realised he had a taste for the meat and confirms that he still enjoys a steak of beef when given a chance. Navelcar’s academic career was a struggle that eventually led to a brilliant fruition. He completed his 9th, 10th, 11th and 12th standard exams in one year with flying colours. On surmounting this hurdle, in 1955 he took the entrance exam to the art college. Here he secured the second place among the numerous students who had answered the exam and began his studies at the Escola Superior de Belas Artes with his scholarship from 1954-62. He struggled in theory class and cultural differences caused his work to be misinterpreted in practical class. He never managed more than 50-60 percent marks. Despite this situation, architect Frederic George exhorted him to avoid copying other artists and hold fast to his own exceptional style. Always preferring to remain apolitical, Navelcar lost his scholarship a few months before graduating because of his decision not to sign a document deprecating Nehru’s actions against Goa. Fortunately for him, the Gulbenkian Foundation came to his rescue, giving him a grant to complete the course. In 1963, Navelcar proceeded to Mozambique, anticipating a job at Lourenco Marques, but instead he was sent to the violence fraught Quelimane to teach geometry and algebra as his primary subjects and art as his secondary in spite of his degree in fine arts. This was the Portuguese government’s vendetta against him, nonetheless he rose to the challenge. The following year he was transferred to Nampula, even farther from where he was originally to go. Here again his education in art was side-lined. Navelcar managed to make the most of it with his indomitable spirit, developing a close relationship with students and colleagues. However he always seemed to clash with his superiors who made life hard for him if possible. A firm believer in the freedom of expression and a people’s right to rule themselves without the interference of a foreign power, Navelcar clandestinely aided the freedom movement in Mozambique by painting murals and posters, but refraining from signing his name. When the leftist FRELIMO (Mozambique Liberation Front) finally came to power in 1975, there was more trouble for Navelcar. He was arrested with his students as they were celebrating an end of term party. The new government was against such frivolities and transported them to a prison camp to reform them. They were released after 81 days of much hardship. Navelcar decided to travel to Portugal to treat a severe ear infection and en route lost his artwork and important documents. It was a hard blow he was dealt but a momentary one. In his distressed state he drew and signed it as Ganesh (Navelcar had had an older brother called Ganesh, who used to appreciate his art and encourage him. Ganesh died aged 15 of a fever, causing Navelcar much grief). Thereafter he would never more sign his work as Vamona Navelcar. To keep the memory of his brother alive, he signs all his work as Ganesh. *Click on --> Vamona Navelcar's Paintings to view them. The prevalent economic turmoil in Portugal made life difficult indeed and prompted Navelcar to head back to his beloved homeland of Goa in 1984. Sadly, the peace he has always sought has eluded him. His pain of betrayal time and again is entirely visible in his paintings, which now also carry the imprint of his African experiences. 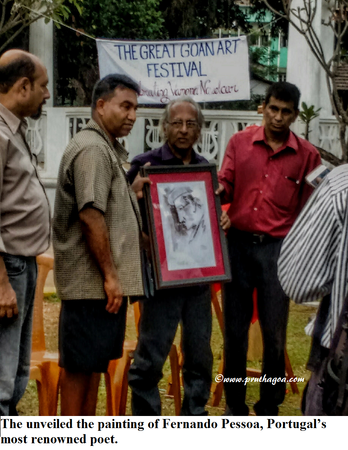 More recently, on the 1st of May 2017, Navelcar was celebrated with a festival held in his honour at the Francisco Luis Gomes Garden in Panjim, thanks to the efforts of Marius Fernandes, Sanjeev Sardessai, Alexyz and other lovers of all things Goan. With the Goa Ghumott Group (Carlos Gonsalves, Fr Dominic Alvares, Willy Goes, supported by Liby Mendonca, Viresh Borkar, Nitesh Borkar, etc) provided a Goan themed background music to most of the festival. Artists, young and old, dotted the venue, immersed in creating a visual delight. Navelcar unveiled the painting of Fernando Pessoa, Portugal’s most renowned poet. The painting was presented along with a Goan ghumot to Prime Minister Antonio Costa of Portugal as he joined in the celebrations of the 30th anniversary of Lisbon's Casa de Goa. The PM’s father Orlando had met with Navelcar, had his portrait painted and discovered their mutual admiration for Fernando Pessoa. Abstract artist Suhas Shilkar spoke of his affinity towards Navelcar, and the paintings Navelcar produced, based on the poems of Rabindranath Tagore. These paintings motivated him in the direction of abstraction. Naguesh Rao Sardessai, noted Goan art critic, hailed Vamona Navelcar as the Bhishma Pitamah of art. A bust of Navelcar was made by Sachin Madage. 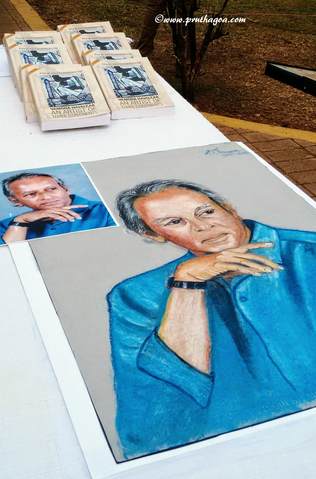 Copies of Vamona Navelcar, An Artist of Three Continents were kept on display along with a likeness of Navelcar by artist Shaistah Thapar. Two of the books were later auctioned. 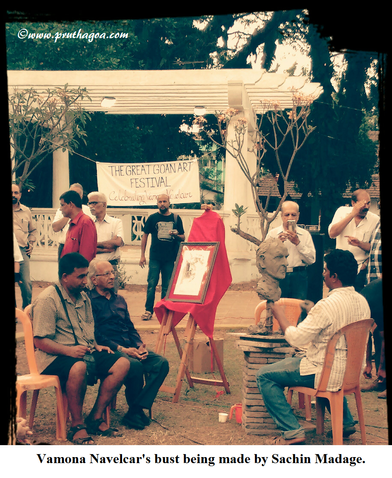 The Great Goan Artist Festival concluded with a thirty minute film on Navelcar by Ronak Kamat and Ashley Fernandes. The two young men will be making a feature length documentary to be screened around the world. 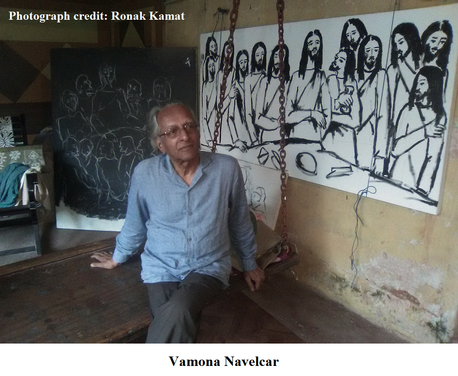 Someday Vamona Navelcar will have his place among the great artists of the world, not just Goa or India. For now, let us come to appreciate him, spread the knowledge of him and revel in the pride of having this veritable treasure in our midst, a Goan artist par excellence.